Carnival celebrations were not limited to Paris, of course. 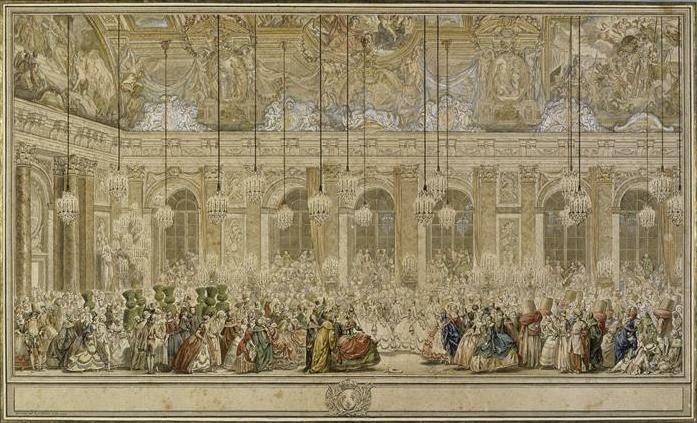 The Court at Versailles also indulged in costume balls. One such masquerade was given in the Hall of Mirrors during the night of the 25th and 26th of February 1745. Two days earlier, the sixteen-year old Dauphin Louis-Ferdinand, son of Louis XV (and future father of Louis XVI) had married his cousin, Infanta Maria Teresa Rafaela of Spain. Queen Marie Leszczynska, wearing no mask, appeared at midnight. She was very elegant in a white gown, all embroidered with pearls, and the enormous Régent and Sancy diamonds sparkled in her hair. She was accompanied by the Dauphin, dressed as a gardener, and his lovely bride as a flower vendor. The new Dauphine danced all night with the utmost grace, only to discover in the morning that the elegant masked Spaniard who had been her dancing partner was not a grandee, as she had believed, but a cook ! 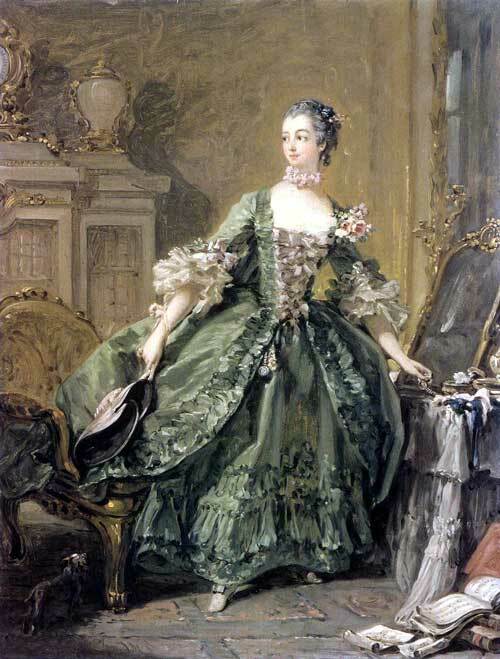 The Princesse de Conti, a member of the royal family, was tired of dancing and went to a nearby salon where refreshments were served. Alas, all the chairs were already taken by other ladies. She took off her mask to reveal her identity and rank, but everyone pretended not to recognize her, and not one guest stood upto give her a seat. Incensed, the Princess left the ball. What about King Louis XV? He was part of a group of eight gentlemen, identically disguised as the trimmed yew trees that decorate the park of Versailles (do you notice them to the left of the picture below?) This gave this famous ball its name: Bal des Ifs, “Ball of the Yew Trees.” The ladies eager to attract His Majesty’s notoriously roving eye faced an awful dilemna: which of the eight identical yew trees was the King?